We also sell pins at Brofist! We have made a set of replica Pokémon badges ourselves which are exactly the same as the 'real' ones from the Pokemon games and tv-show! Buying Pokémon badges is a lot easier than getting them from Gym Leaders! Even though Team Rocket had Pokemon badges for sale for dark reasons, we made ours because we are massive fans of the brand! The badges are of the highest quality. Pokémon Badges Er is 1 product. De complete set van 8 Pokemon gym badges van Generatie 1 van Pokémon Red en Blue, zoals ze te vinden zijn in de Kanto regio! 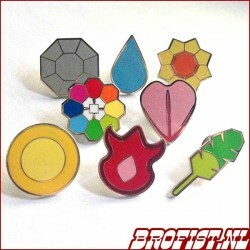 Pokemon badges kopen is makkelijker dan Gym Leaders verslaan! Gemaakt door het team van Brofist.